Boil two potatoes peal the skin and mashed it well, Take a pan and 2tsp oil add mustard seeds and crackle it, Add ginger ,curry leaves, green chilies , asafetida ,Garlic and stir till the aroma of raw ginger disappear add red chili (optional you need more spicy) salt and stir it for 2 minutes . Now add mashed potatoes, and fresh chopped coriander leaves in it and mixed it well stir for 2-3 minutes. Make small size balls and keep it aside. Take a bowl and make a smooth batter with the help of water from 1 ½ cup of Besan/gram floor add 1/3tsb turmeric, pinch of baking soda and mixed it well. Heat a frying pan and add oil to fry vada , dip the potato balls in the better and coat it. Gentle drop the coated vada in medium hot oil and fry it on medium flame till it turns golden brown, drain the extra oil and put it on a kitchen paper. Do the same for other vada’s Now the Vada’s are ready. Take small size pav’s cut it from middle and spread green chutney and sweet chutney and raw garlic chutney (optional). Place the vada like sandwich in between the pav’s or breads. 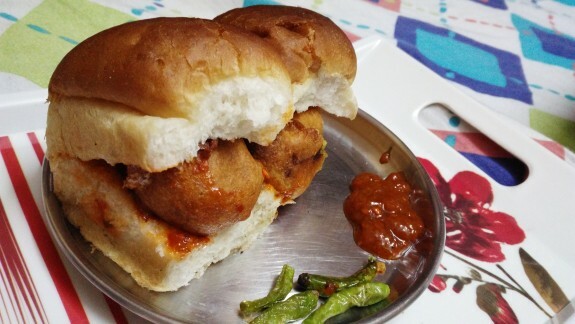 Now the crispy and delicious Vada pav is ready serve it with green, sweet chutney and fried green chilies.